We use a holistic approach called integral human development to help people reach their full potential in an atmosphere of peace, social justice and human dignity. This long-term, dynamic process facilitates collaboration across civil society and the public and private sectors. We engage people at every level—individual, family, community, regional, national and international—to promote transformative and sustainable change. We promote access to high quality education, especially for marginalized kids. 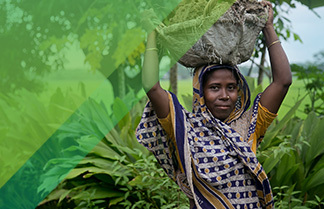 We help poor communities create sustainable savings and lending groups. We help disadvantaged people gain access to safe water and sanitation services. We address the root causes of exclusion and inequity to help bring about peace. We help strengthen institutions so communities can lead their own development. CRS is empowering youth to contribute to sustainable change on a large scale. Be the first to know about new research, tools and resources. Connect with us to stay informed about new resources for relief and development professionals. We work closely with governments, civil-society organizations, the private sector and research organizations to create lasting solutions to poverty and injustice. We bring to our partnerships our global scale, our decades of experience and our vast network of partners. Together, we can achieve results that no single organization could achieve on its own.